The most innovative and important presentations for A-Fib patients dealt with “Noninvasive Electrocardiographic Imaging (ECGI).1” Two presenters gave complimentary talks on this subject—Dr. Phillip Cuculich of Barnes Jewish Hospital in St. Louis and Dr. Michel Haissaguerre of the French Bordeaux group. During a standard catheter ablation, doctors use a special mapping catheter that has to be positioned inside the heart to map and identify A-Fib producing spots in the heart. 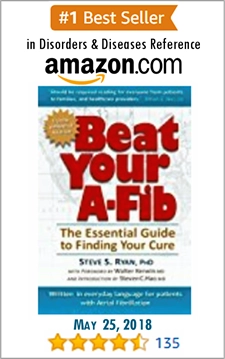 This can take a good deal of time and effort depending on the complexity of the A-Fib case. But the new Noninvasive Electrocardiographic Imaging (ECGI) system does not go inside the heart, but instead uses a vest-like device which a patient wears to image the inside of the heart and to pinpoint sites in the heart producing A-Fib signals. Patient during ECGI with Dr. M. Haissaguerre (used with permission, CardioInsight). One of the beauties of the ECGI system is it doesn’t have to be done in an EP lab or have an EP doctor present. There is no need to move as fast as possible as when using a mapping catheter inside the heart. And a trained technician can do it. Unlike a busy EP lab, the technician and patient doing the ECGI looked very relaxed, comfortable and un-pressured. Non-invasive activation sequence during Atrial Flutter. Dr. Haissaguerre’s emphasis was on the clinical effectiveness of ECGI. He had used the ECGI system for three months. 10 patients were in Paroxysmal A-Fib. He described and showed examples of how the ECGI system showed sources of A-Fib coming from the PVs and the posterior left atrium. The ECGI showed a rotor coming from a PV, and in another example a rotor coming from the left atrial appendage. In another patient a rotor came from the septum. In one patient he was able to identify and terminate A-Fib in seven minutes using the ECGI system. But in patients with persistent A-Fib, things were a bit more challenging. Most had multiple sources or spots in the heart producing A-Fib signals. There could be as many as six different rotors swirling around in the heart. (This is similar to the finding of Dr. Narayan’s FIRM system which uses a large basket catheter inside the heart to map and identify A-Fib sources.) 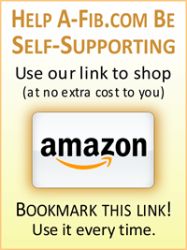 Dr. Haissaguerre talked about using “inner windows” in the ECGI and a “brushing technique” (these are terms the author didn’t understand and has written Dr. Haissaguerre for further explanation). Of 58 persistent patients (the hardest to cure), he was able to terminate A-Fib in 51 (88% success rate) using the ECGI system. The ECGI system is a major medical breakthrough for A-Fib patients. The ECGI system seems to have a greater sensitivity and specificity—the ability to identify spots in the heart which are producing A-Fib signals with remarkable precision, and in color and 3D. And the mapping can be done outside of the EP lab by a technician rather than by an EP doctor. When the doctor does an ablation on a particular patient, using the ECGI system they have a complete, detailed, precise, 3D, color video of each spot in the patient’s heart producing A-Fib signals which a technician has produced before the ablation. The ECGI map is a better, more accurate, more complete map than the EP could produce by using mapping catheters inside the patient’s heart. And the EP no longer has to spend time mapping, but can concentrate all his attention on the actual ablations that need to be performed. 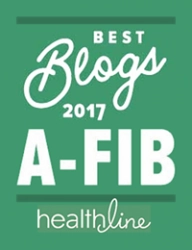 This author predicts that the ECGI system, barring unforeseen circumstances, will rapidly supersede all other mapping systems and will become the standard of care in the treatment of A-Fib patients. Someone asked me “How much CT scan is a patient exposed to during the ECGI mapping?” I didn’t know the answer and had to email the doctors. Here’s the response I got. “The CT scan is done at a very low radiation dose, without IV contrast. It takes about 10 seconds to do the CT scan.” In practice doctors have to do a CT scan anyway to map the basic geometry of the heart. The ECGI is done at the same time. Usually the CT scan and ECGI are done the day before the ablation. The data is processed overnight. The ECGI maps/movies/data are ready to use the next morning. Someone asked me if the rotors and A-Fib spots remain stable. (I knew the answer to this, because I had asked Dr. Jais this myself.) When you watch the ECGI movies of A-Fib rotors, for example, there does seem to be some movement from one heart beat to another. But Dr. Jais said that in practice the ECGI map allows doctors to identify the A-Fib producing spot, that the slight movement of the rotors isn’t enough to throw off the identification of the A-Fib producing spot. 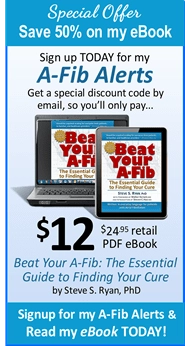 I asked the doctors if I could obtain ECGI movies of A-Fib which they showed at the Symposium. Unfortunately, because their studies aren’t published yet, they couldn’t give me any ECGI movies. However we were able to obtain some beautiful still shots of images produced by ECGI. Also, ECGI will be used to track patients over time. Since all you have to do is put on a vest and lay on an examination table, ECGIs can be used like nurses use ECGs today in your doctor’s office. (ECGIs may one day replace ECGs in your doctor’s office!) With an ECGI your doctor will be able to tell you not only whether or not you have A-Fib (which an ECG can do now), but what kind you have (focal, rotor, etc. )., where precisely in your heart these signals are coming from, how many A-Fib producing spots you have in your heart, and how much and how fast your heart is remodeling over time. Dr. Cuculich’s and Dr. Haissaguerre’s presentations were truly historic. 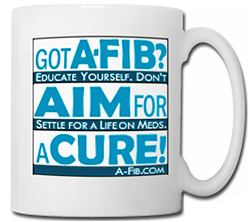 They represent one of the most important new developments in the treatment of A-Fib patients. Many have asked when can we expect to see an ECGI system in our doctor’s office or in A-Fib labs. Here is the approximate time table and plan to bring ECGI to market. The ECGI system is being developed by CardioInsight (http://www.cardioinsight.com/). CardioInsight refers to its system not as ECGI but rather as Electrocardiographic Modeling (ECM). Right now Dr. Michel Haissaguerre and the French Bordeaux Group are using it with good results (see earlier reports). Approximately 700 procedures have been performed in nine different US and European centers for a variety of cardiac arrhythmias. 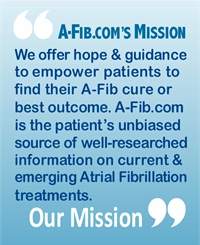 The company is currently focused on two rapidly growing and unique applications, A-Fib and cardiac resynchronization therapy (CRT), with Dr. Haissaguerre having already performed more than 80 A-Fib procedures. There will be at least 10 presentations on this technology at the upcoming Heart Rhythm Society Scientific Symposium in Denver this May. The next step is to demonstrate that the high success rate enjoyed in Bordeaux is transferrable to other centers. The company is now conducting clinical trials at 2 additional European sites. Jim Hassett of CardioInsight states that when these trials are complete, the company will evaluate the appropriate next steps to either gain regulatory approvals so that the technology may become commercially available or conduct additional studies in the US to further demonstrate the clinical utility of this mapping technology for A-Fib. Can you buy stock in ECGI or CardioInsight? No. CardioInsight is a privately-held company not listed on the stock exchanges. It’s correct to say the ECGI does not directly map the septum area. But, that doesn’t mean the septal activity can’t be mapped with the ECGI. So don’t be reluctant to seek out the new mapping and ablation vest system ECGI (by CardioInsight). Just be sure you have a top-notch, experienced operator.